The Internet and development of digital technologies have unleashed a paradigm shift. At one time, support for preservation of the arts did not carry with it the expectation of access.... Today, preservation and access have become joined, locked together in the realm of sound recordings. First Sounds seeks to discover, preserve, and provide access to the world's earliest audio recordings. We have digitally preserved every airborne sound recording known to exist from before 1861, plus many incunabular recordings made thereafter, and we offer free and universal access to our images and sounds on this site. Once we identify an item of interest, we negotiate with the custodial institution to image it. We digitize all manuscripts, documents, and phonautograms at 600 DPI 24-bit RGB (color). These images are the basis of our facsimiles and other publications. We digitize each phonautogram a second time at 2400 DPI 24-bit monochrome (black and white). We use these higher resolution images for our eductions. 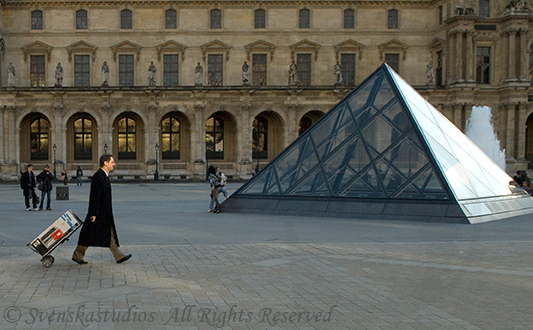 Preservation gear in tow, David Giovannoni crosses the courtyard of the Louvre after a day of work in the Académie des sciences. We provide our digital images to the documents' custodians to ingest into their electronic access services and archival storage systems. The documents have been well preserved for 150 years by these custodians. But as recognition of these artifacts increases, so does demand for access by scholars, media, and others. The images made by First Sounds help to mitigate physical risk by satisfying many if not most of these requests. Where required, First Sounds has paid licensing fees to custodial institutions so we may present our images here. We believe humanity's earliest sound recordings transcend national considerations. We present them here as the patrimony of all mankind under a Creative Commons Attribution (BY) license, which allows for their re-use with express attribution to First Sounds. We encourage their study and appreciation.